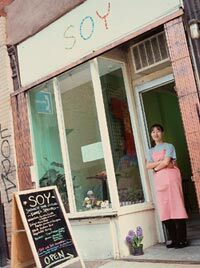 SOY first opened as a cute little cozy comfy Japanese home cooking restaurant in 2002 at 102 Suffolk Street in the Lower East Side of Manhattan. In summer 2017, SOY made a big move to a quaint Hudson Valley town of Rosendale, 90-mile north of NYC. Situated on the bank of Rondout Creek, SOY has made a step forward to its early motto: "More than great food and free hugs." Outdoor deck and garden seating with beautiful scenary were the main reason Etsko decided to take this spot. With fresh local produce and amazing backdrop, SOY is truly a place to feel complete and well nourished. Soy is not a vegetarian restaurant. Although we serve many vegetarian dishes, we also have choices with meat and fish. In Japan, we cook soy products just like another vegetable. Soy as meat substitute for vegetarian is an American concept. Soy is wonderful food for everyone. We would like to bring soy to everyone's table, because it's healthy and delicious. "No, we do not have sushi." Soy is a Japanese home cooking restaurant. We serve authentic traditional dishes such as Niku Jaga and Gomoku-mame, or not so traditional popular favorites like Curry Rice and Potato Croquettes. Sushi is actually not a typical Japanese cuisine in Japan, especially in home cooking. "Some are traditional, some are my mom's recipes, and many are my own creations." Soy's owner/chef Etsuko Kizawa is a filmmaker, designer, marathon runner, among other little endeavors. She brings in authenticity and creativity to the SOY's innovative menu.